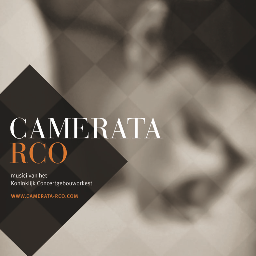 Formed by members of Amsterdam’s famed Royal Concertgebouw Orchestra (RCO), Camerata RCO performs chamber music in multiple formations from duet to small chamber orchestra, with a special focus on the Classical and Romantic repertoire for winds and strings, and active relationships with living composers. It is an absolute love of chamber music that drives these musicians to divert time out of their busy schedules, as members of one of the world’s greatest orchestras, to perform together as Camerata RCO. Praised by the New York Times for their ​“warm, glowing performance,” the ensemble has enjoyed tremendous success in the Netherlands and abroad and now performs around 50 concerts a season internationally in music capitals such as Amsterdam, Vienna, Tokyo, Seoul, Madrid, Rome and New York. Their ever-expanding discography on Gutman Records includes recordings of works by Corelli, Mozart, Mendelssohn, Mahler, and Ravel. Recent highlights include a critically acclaimed tour of South Korea; a week long residency at the Festival Musika-Música in Bilbao, Spain; concerts in both halls of the Amsterdam Concertgebouw; their UK debut in Cambridge; and a special benefit concert directed by New York Philharmonic music director designate and former Concertgebouw concertmaster Jaap Van Zweden. Camerata RCO has recorded several CD’s on the label Gutman Records. The latest Cd is Mahler 4th Symphony in ensemble version with conductor Lucas Macias Navarro.